Extra-long spout dispenses directly into the sink, hand, pot & scrubber. Kitchen Soap Dispenser is a big improvement over typical soap dispensers. This heavy acrylic design has an extra long spout that leaves plenty of clearance underneath for direct dispensing. Squirts soap right into the sink without dribbling on the sides and surfaces. 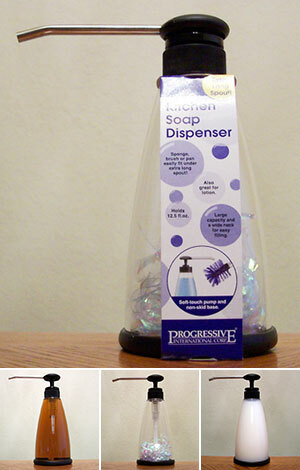 Lets you add soap to brushes and sponges with ease and deposits the soap into pots and pans with precision. No more wasted drips. 1½ inch Soft-touch top - Nonskid rubber base - 3½ inch Stainless steel spout ease filling wide mouth neck - 12½ ounce capacity - 8 inches high - Dispenser sold empty. We Recommend using the Dish Glow either straight or 50/50 dilution for this product. May also be used for Shampoo or Lotion.